It’s New Year’s resolution time—time to make a list of things we want to do to better ourselves and then abandon the list within a month, right? Indeed, I’ve been reading that as many as 80% of New Year’s resolutions are broken by February. Why even bother? Or is it still a good idea but we’re doing it wrong? I’d like to suggest that it’s not a bad idea but that we be kind to ourselves—that we focus more on process than on results and that goals be re-evaluated on a regular basis. You may have heard of SMART goals, and I’d like to consider the A in that model: Attainable. To begin with, what are your chances of following through if your goals don’t fit your circumstances? Or if they’re what you think you should be doing rather than what is truly right for you? If your goals are too ambitious or you’re not fully committed to them, you’re destined to fail. Sometimes you consider a goal attainable when you set it, but life happens and it’s no longer manageable. This could be due to a family emergency, an injury, the ebb and flow of energy for those who have chronic health issues, or other circumstances that throw you off course. This is a learning opportunity, not a failure! 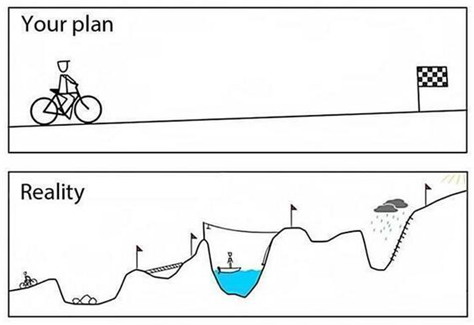 We tend to think that when we set goals, we have to stick to them come hell or high water (or else we’re a failure). Sometimes powering through does work, but re-evaluating a goal is a compassionate action that is more likely to bring success down the line. Can you modify the goal, even temporarily, so that it’s attainable in your new circumstances? Can you put it on the back burner until you resolve the situation? Or might it be that it’s just not a great goal for you and you’re better off to toss it and establish a new one? It can be useful to have a Plan B in place from the get-go, especially if you have a chronic medical condition that flares from time to time. If a barrier makes your goal unmanageable, what can you do instead and still respect your original intentions ? Having a plan in advance can save you from floundering or, worse, giving up. We tend to think of goals as a steady path from where we are now to where we want to be, but that’s not how life works. Be kind to yourself! Plan to re-evaluate your goals, and you’ll have a much better chance of actually following through with your New Year’s resolutions this year. Do note that it can work the other way, too—if things are going particularly well, why stick to the original goal? Your re-evaluation just might mean increasing the challenge and progressing faster or further. And so, I resolve (my only public resolution!) to publish a blog post every other Tuesday. My Plan B is to reduce my postings to once a month. On the other hand, I might post once a week if I get faster at writing. Stay tuned! I see it all the time—people who are deconditioned or obese are told that walking is the best exercise. For some, it is. It’s convenient. It doesn’t require any special skills. All you need is a good pair of shoes. And it’s easy to increase the challenge in incremental steps (literally!). But it’s not so good for everybody. Walking can aggravate imbalances in the body and create pain—in the lower back, the hips, the knees, the feet. And then it’s a slog. And potentially harmful. This is especially the case for people carrying excess weight on their frames. And for those people, it’s best to start with mobility and stability exercises, which Dr. Google can provide but which are best taught by a physiotherapist or personal trainer. This is optimal for avoiding pain when walking. For those not ready or able to seek out a physiotherapist or personal trainer, the pool is an excellent place to start. Not swimming, yet. Just hanging out in chest-deep water and moving. The water provides support and, not inconsequentially, nurturance. It’s a pleasurable environment for somebody with extra fat because fat is buoyant. (It’s a very different story for muscular individuals, but that’s not who we’re talking about.) This is a safe, low-impact way to move. And if you want to get a bit more of a workout, aquafit classes are effective and essentially risk-free. I’m also a fan of strength training for the plus-sized person. Ever notice how big Olympic weightlifters are? For pumping iron, a larger body is an advantage, and plus-sized individuals who are deconditioned can make much more rapid progress with weights than with aerobic exercise, which in turn is motivating. Once a foundation of strength is built, then aerobics will be easier. Get some instruction, and then go for it! Chair exercises are another way to get going. It’s surprising how effective exercising sitting down can be, and this may be an option for those who absolutely don’t want to be seen in a swimsuit 1 or are intimidated by the gym. The best option is a local class, provided the instructor is competent and compassionate, but there are lots of chair workouts on YouTube as well. So, if walking floats your boat and makes you feel good, do it! But if not, don’t feel like a failure… but do find something else that works for you. So, it’s been another year (and a bit). Where have I been? What happened to this blog, anyway? Well, I’ve been struggling with depression and weight gain. And I’ve been beating myself up and wondering how I could be a health coach when I’m so overweight myself and so prone to depression. How could I be credible when “clearly” I’m not able to achieve success myself? And then I hang out on personal trainer and health coach pages on Facebook and YouTube and see things that make me so angry! That is, some of it makes me angry. Not all coaches by a long stretch are so lacking in understanding about the myriad factors that contribute to obesity as the ones who raise my ire, and some are truly sensitive to their obese clients. But I don’t think a lot of them really know what it’s like to walk in an obese client’s shoes. And that fires me up to be the coach who truly understands. There’s a term in the coaching business, limiting factors, that the fit-all-their-life coaches often can’t relate to. I’m talking especially about the “just eat less and move more” mentality—the lack of understanding of circumstances such as the social and emotional hurdles an obese person who wants to optimize their health may be facing. I’ve even seen coaches who have chosen to gain weight on purpose and then lose it “in order to understand” what their clients go through. What I’ve observed are people with a solid baseline of health and fitness allowing themselves to go to pot for a short time and then returning to baseline, complaining about how difficult it was. Yeah, right. If they can do it, so can you. No, no, and no! There’s a world of difference between that stunt and trying to lose weight when there is no baseline of fitness (at least not in recent history) and perhaps years of coping with life in ways that aren’t amenable to leanness and good health. Not to mention genetics, mental health, environment, and social support, among other factors. Perhaps I’m the one being insensitive now, but I doubt very much that those coaches who “struggle” to lose the weight that they’ve intentionally put on really do experience what their long-time-obese clients face. And they certainly shouldn’t use their contrived experience of losing weight as a tool to belittle their clients’ efforts. Those of us who are plus-sized coaches truly get it. We’ve walked—and are still walking—in those shoes. With a solid foundation of knowledge about fitness, nutrition, and behaviour change, we need to get out there and use our understanding of what it’s like to be obese—our experience with those limiting factors—to offer solid support to our clients. Perhaps we will even coach them to higher levels than we ourselves have attained. That is, after all, a coaching relationship prevalent in the professional sports world. I’m in a good place now. After half a lifetime of trial and error, I’ve gotten past the depression with the help of the right antidepressant at the right dose. So when I see some of that stuff on Facebook and YouTube… Yes, I’d better put those doubts about my credibility in their place and make myself more available to the people who need a coach they can relate to and who will relate to them. I challenge other plus-sized people with an interest in nutrition and fitness to do the same. People react with shock when I mention that I weigh myself daily. After all, common wisdom dictates that this is a bad thing. I’ve even had a doctor have a hissy fit when I’ve mentioned this. But why is it a bad thing? Indeed, it is a bad thing if you use the data to reward or punish yourself. If you celebrate with a big hunk of chocolate cheesecake because the scale says you lost 2 pounds since yesterday, that isn’t so good. Or if you give up on new habits in despair because the scale says you’ve gone up 2 pounds since yesterday, that isn’t so good, either. Even with very extreme dieting, you simply cannot lose or gain that much fat in a day. What you are measuring is dehydration or water retention or digestive issues or some other factor that isn’t actual weight gain or loss. It’s biologically impossible. And that is precisely why I do like to weigh myself daily. With a weekly weigh-in, a larger-than-expected gain can indeed be true weight gain—or it can be some weird non-weight issue. I’ve had times when my weight has fluctuated as much as 5 pounds in one day. If I see that kind of change over the course of a day or two, I know it’s not something to worry about and that it will just as quickly reverse itself. But if I see a gradual increasing trend, I see it as an early warning signal indicating that I need to tweak my habits a bit before things get out of hand. So if you find it kind of interesting to watch the strange ups and downs of the numbers on the scale and can treat this as useful data over the long run, go ahead and weigh yourself every day. It’s something that many long-term weight maintainers (such as many of those on the National Weight Control Registry) do. But if you react emotionally to frequent weighing, then it’s not a good idea. Quite frankly, in that case I think it’s better not to weigh yourself at all. Focus instead on building good habits, and your health will improve regardless of the speed with which your weight does or does not come off.